By Jim Dower: World Boxing Organization middleweight champion Demetrius ‘Boo Boo’ Andrade (27-0, 17 KOs) will be making his second defense of his title on June 22 against an opponent still to be determined on DAZN at the Dunkin’ Donuts Center in Providence, Rhode Island. Andrade, 30, needs a win here to keep himself in position to potentially get the winner of the May 4 fight between WBA/WBC middleweight champion Saul Canelo Alvarez and IBF champion Danny Jacobs. Andrade is in a good position to get the winner or the loser of the Canelo-Jacobs fight. If Canelo doesn’t get either of them, then there’s a chance that former WBO champion Billy Joe Saunders will drop back down to challenge Andrade for his title. Andrade needs a better performance in his next fight than the one he made last January in beating fringe contender Artur Akavov (19-3 8 KOs) by a 12th round knockout, which was a premature stoppage by referee Arthur Mercante Jr. Andrade had been trying to get a stoppage throughout the fight, but he lacked the punching power to get the job done. 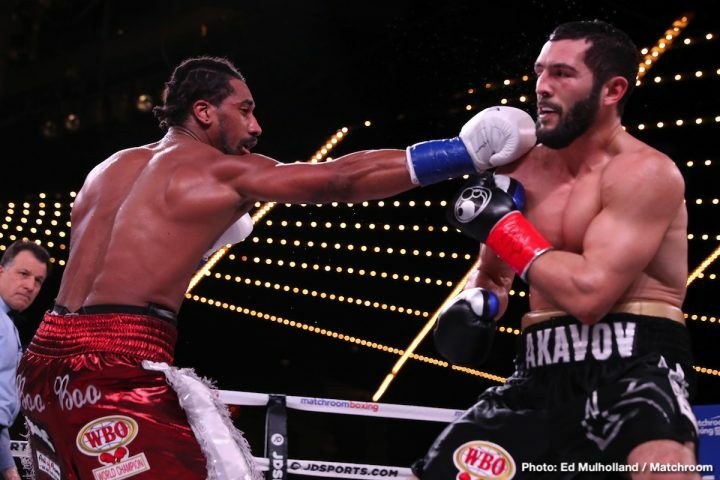 Akavov was giving Andrade problems with his short bursts of punches. It wasn’t until the last three rounds that Andrade started dominating against the gassed put Akavov. Whoever Andrade fights next, he’s going to have to raise the bar. Matchroom Boxing USA promoter Eddie Hearn will be the one that picks out Andrade’s opponent. Given what’s on the line as far as big fights potentially against Canelo, Jacobs or even Gennady Golovkin, it’s unlikely that Andrade will be fighting anyone good for his June 22 title defense. 2008 U.S Olympian Andrade won the vacant WBO 160 lb title last October in beating Walter Kautondokwa by a 12 round unanimous decision. It was a good performance by Andrade against a fighter that clearly didn’t belong rated #1 by the WBO. The sanctioning body has been coming up with odd rankings in putting guys that don’t arguably belong rated at #1 or even #15. For example, the WBO currently has Dennis Hogan as their #1 ranked contender at junior middleweight. Hogan is rated above Julian ‘J-Rock’ Williams, Kell Brook and Carlos Adames in the WBO’s rankings.